It is that time of year when I run around like a chicken with it's head cut off (not that I've ever seen such a thing). I seem to overbuy for one person's stocking while being a bit short on the next one. I promise myself that I will finish these projects and then avoid them by doing other things. I am frazzled! So, we try to take the focus off the busyness of Christmas every year (I don't always succeed) and focus on the reason we are celebrating. This year we are reading Tabitha's Travels for our Advent story. This is one of three Advent stories by Arnold Ytreeide. Almost every night there is a cliff-hanger, making children eager to hear more in these action packed stories. Each evening, though, the wrap up of the story points back to Jesus in some way (even though we don't see Him until Christmas). What a way to celebrate! 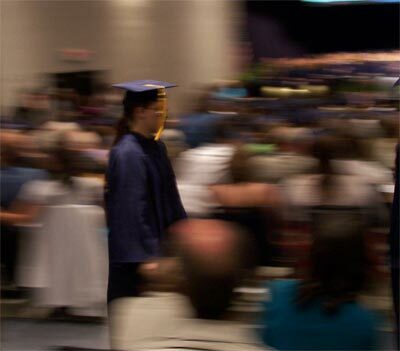 Make everything focus on Jesus. Whether or not he was born on December 25, it is the one day we set aside to remember His miraculous birth and what a difference He has made in our lives. If He hadn't been born to die, I would still be stuck in my sin, separated from God forever. Hallelujah! Glory to God in the Highest! For Unto Us A Child Is Born! May your Christmas be blessed with His Love! 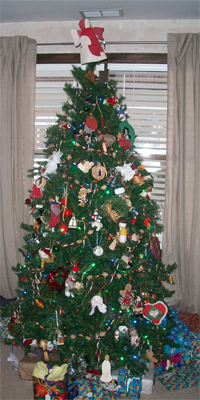 Yes, that is our tree, complete with a tipsy quilted angel on top. The children decorated it one afternoon while The Army Guy and I were doing other things. We were the only people to show up for the 12:01 am showing of The Voyage of the Dawn Treader this morning. We had a great time and enjoyed the movie A LOT! 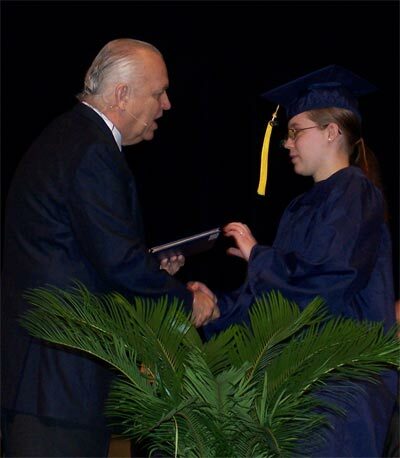 The children should remember this as a very happy family memory (and not just mandatory fun). They got Eustace Scrubb right :) Caspian is the right age :) And the ending was right, too. It looked just like I imagined it from the first time I read the book (almost 40 years ago!). No, it is not a visual of the book. They do veer a bit from the story by adding an element that is their vehicle for tie-ing the story together in the short time of a movie. There were also a couple of telling/not showing instances...again, I think this was so that the movie could move along. They also got some things out of order in the book's time-line, but that really didn't detract from the movie, IMO. While there were a few things *I* might have done differently, I think this was a great adaptation of the story as they kept the important elements. When are you going to see it? 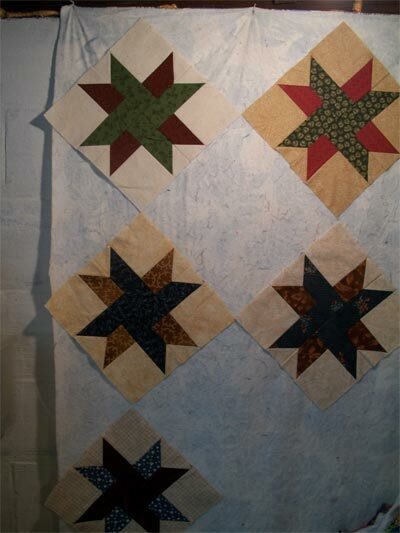 I have not been doing much quilting. My quilting machine needs some TLC that only a shop can provide and I had a craft show to prepare for as well as a trip to MI to visit with family over Thanksgiving. I drew up all the pictures for the blocks and we came up with four different sets; Fairytale, Sci-Fi, Adventure and Everyday. All of my children think they are great and have been thinking up new ideas for the cubes...I think they want to have their own sets! 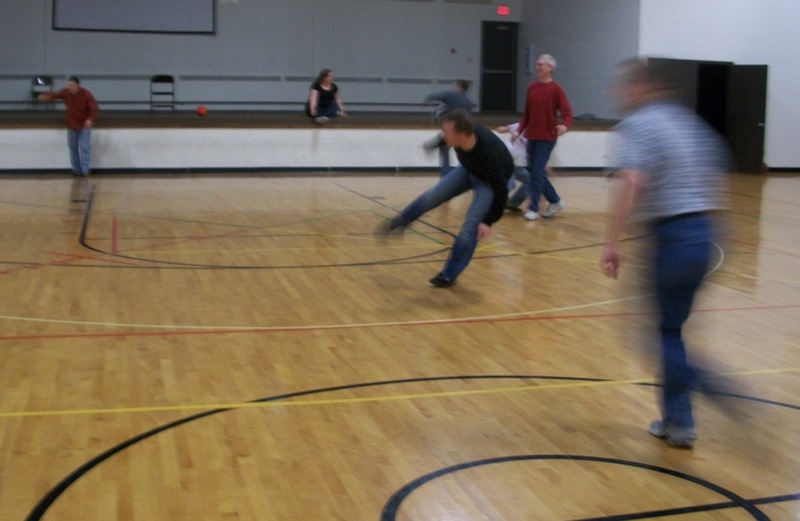 While in MI, The Army Guy had a family Christmas Party.One of the highlights of the party was the Dodge Ball Game. At least most of the guys and a lot of the kids thought so! 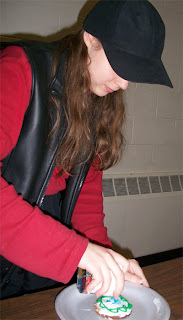 They also had cookie decorating available and Princess Sunshine took part. 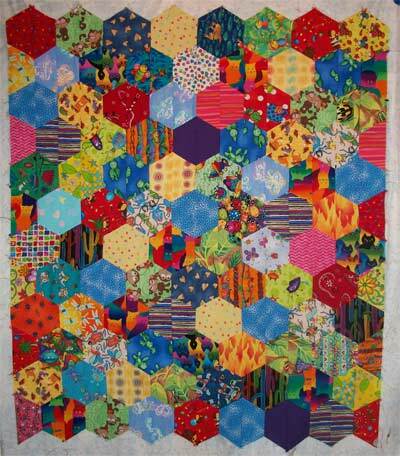 I have finished the baby quilt that I made using the faux hexagon blocks. It is cute and I'm glad I tried the technique, but I don't think I'll be making a bigger quilt with them any time soon. I was asked previously how I was going to quilt this...and I was undecided. It was time for another round of the Obnoxious Fabric Swap and I finished up swapping them last week. 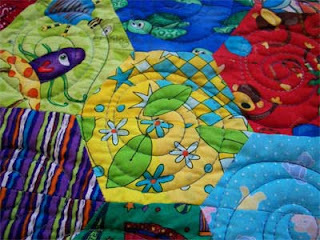 It is a fun swap that I hostess twice a year on the About.com Quilting Forum. Florals reigned supreme in the obnoxious mix (as they always do). What in the world are some designers thinking when they make some of the weird color combos? Next up were the Amphibian and Lizard category. Lots of brights, a few skulls, some psychedelic designs, weird color combos, texture prints...and some that must have been taking over various stashes around the country :) I saw a couple of fabrics that I would have purchased had I seen them on the bolt...and not for this swap! The picture is from the center of my living room while I was swapping. I sit in the hole in the middle and swap directly in front of me (see the stack, the spreadsheet and pencil?) and have all of the piles arrayed around me. You can not see all of them as the picture is rectangular and the piles of fabric were a bit farther out on each side (and on the couch and love seat!). Yes, that is Killer Bunnies on the ottoman. The boybarian has been begging to have a family game night, but we haven't all been home for a game night in weeks! This was from a (small) swap of blocks and I now realize that 8 blocks is NOT enough for a quilt. I should have signed up to make more blocks for this swap! 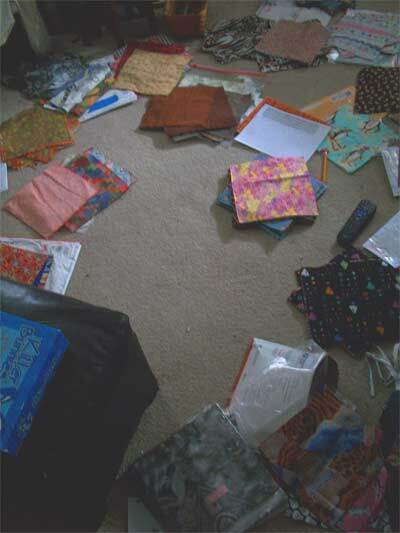 I'm going to have to do some digging out of fabrics to make more so that I have something to work with. 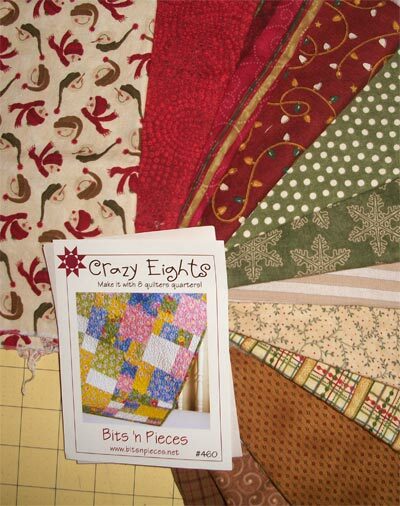 I am going to leave them on my design wall while I dig for the pattern...maybe I can make up a few each week and eventually have enough for a quilt! I have finished this baby quilt top and it is up on my design wall so I don't forget to quilt it :) This was the other top I worked on while at our guild retreat a week ago. 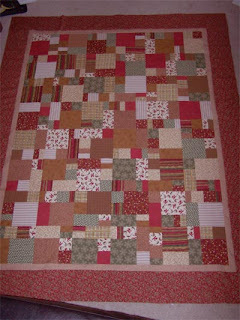 This really needs to be quilted as the baby has already been born...and I need to mail this half way around the world! 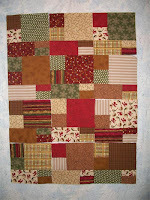 Check out other design wall inspiration at Patchwork Times! 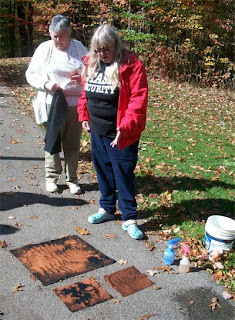 at our retreat one of the participants showed us Bleach Discharge. It is something I'd read about but had never tried so I was interested. 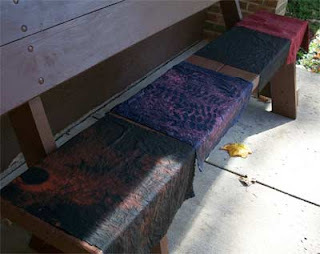 Most of us used a Moda black for our discharge pieces. I understand that different fabrics will give different results. 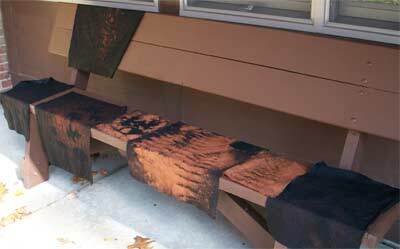 Some black fabrics will discharge gray, some more of a purple...test before doing this on large or important pieces! Our Quilt Guild held a retreat last weekend and it was WONDERFUL to get away and dedicate a whole weekend to my machine. I think everyone had a great time. AND *I* had a productive time. 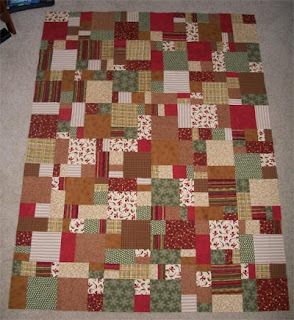 I finished one top that I had set aside when it was 3/4 done (I'll blog that one later this week) and went from a Jelly Roll to a completely pieced field over the weekend. 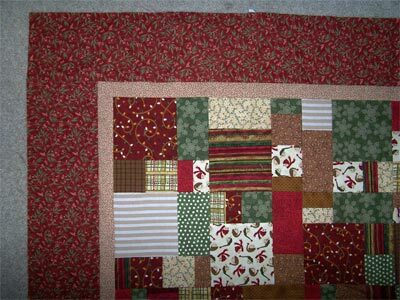 The second picture is just before I sewed the field together. We rearranged a couple blocks after I took the picture...but I forgot to take a picture of the completed field. while recuperating. I'm getting a little bit done every day...not much, but it is more than nothing (like last week) and that makes me happy. This is what I worked on most of the week. I used machine applique that mimics hand applique - no fusing and turned under edges. I'm hoping that it will be acceptable for our guild raffle quilt...that the hand piecers won't reject it! Everyone in the guild will need to make up some Four Patch blocks, so I thought I'd sew up a couple using fabrics from the basket block. I had them all the same in the EQ version I drew up, but I want them to be scrappy, not all the same. 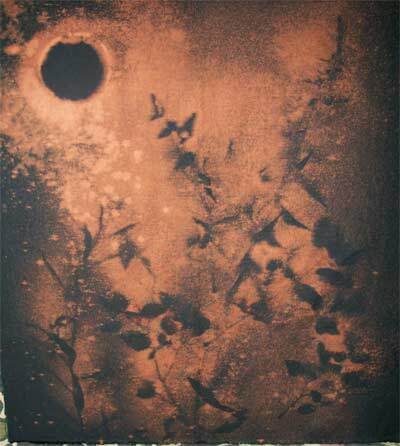 I'm hoping your monitor doesn't show this picture as dark as mine does...it is not that dark in real life! 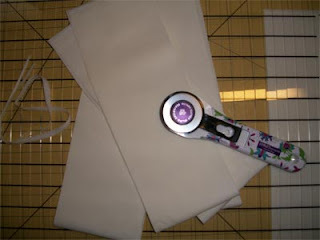 some time in the sewing dungeon...finally! It has been a while since I spent some quality time with my sewing machine. I was working hard on quilting so we could take down the quilting frame and move The Peanut into her room and out of the den. 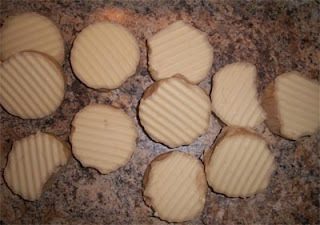 And then I made up some soap...and now I'm recuperating from surgery *sigh* my poor neglected machine. 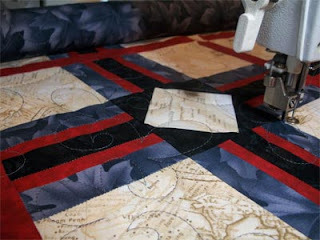 This morning I went down to the dungeon and worked on Clue #2 for a mystery quilt over on about.com. You can barely see the white fabric against my design wall, but it is there. I also cut up inspiration fabric for our guild's next raffle quilt, so everyone will have a color palette to work with. For more inspiration visit Patchwork Times and drool over the many design walls posted there! 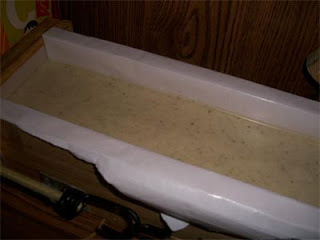 I cut the soap and have it set aside to "cure"
Soap needs to spend some time sitting as the saponification finishes up and extra moisture evaporates out. 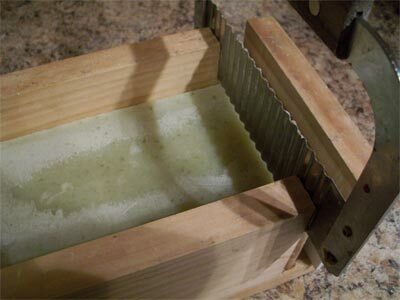 The soap CAN be used right away, but as it cures, it becomes milder. The soap smells lovely and is hardening up nicely. 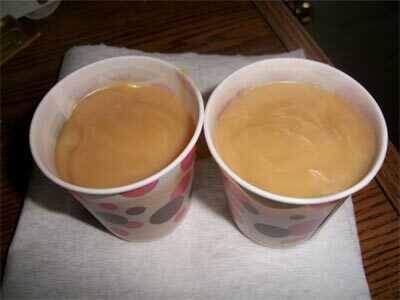 It will also darken a bit as there is some vanilla in the scent blend which always turns soap brown. today I made a bit of soap...this is Cedar and Sage sitting nicely in the mold. I will unmold and cut it tomorrow. The recipe behaved beautifully. 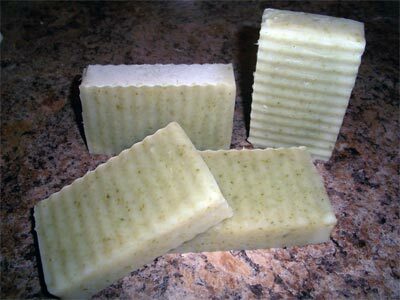 The specks are parsley...I thought they would give a good look to the soap. Parsley is one of the very few things that retains it's color in the saponification process. 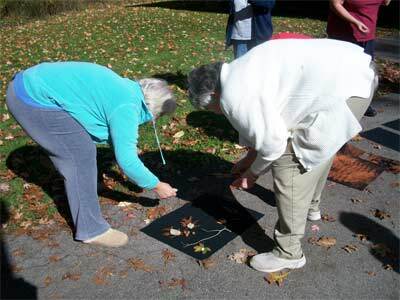 Most other botanical items turn brown. I also made a small test batch for a customer. He wants a more moisturizing soap, so I cut WAY back on my coconut oil, used both cocoa butter AND shea butter (in higher percentages) and superfatted a bit. This second batch overheated and grew out of the tube. 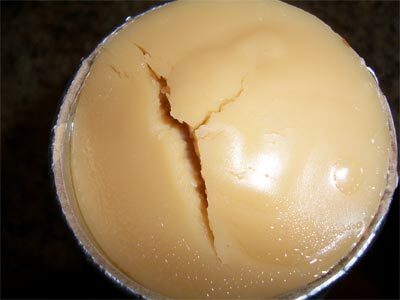 You can see that it even cracked on the top. I stuck that baby in the refrigerator to cool it down and it stopped growing at 1" above the disposable mold. I have to admit that I unmolded this one WAY early as it was already pretty hard at 6 hours and I wanted to see what was going on inside. The plastic lining on my disposable soap mold (AKA Pringles can) bubbled with the heat and left me with moon crater soap that smells lovely and I'm hoping will be delightful on the skin - so who cares how it looks? 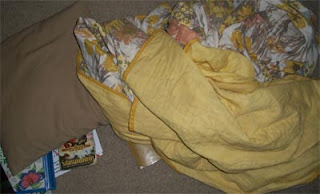 The Peanut has been sleeping in our den since she came home from school. 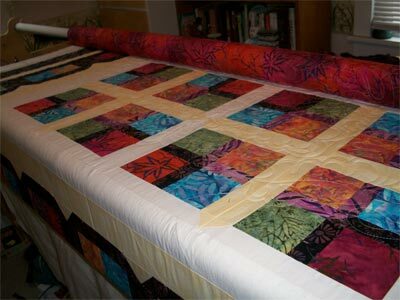 The quilt frame takes up her whole bedroom, so she can't use her room until the frame comes down. Today I quilted the last quilt of the week. 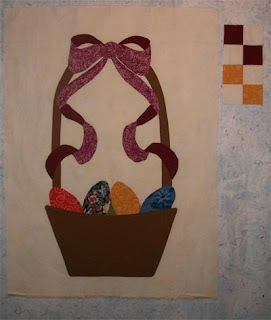 I have to be done because I am almost out of batting (I guess I could do a couple of baby quilts if I had the tops ready). The frame will come down this weekend (maybe Monday). These Are a Few of My Favorite Batiks because they are. Some of these I'd been hoarding for a while and didn't want them to go into just any project. I'm thinking this might end up being my "retreat" quilt. The one I take along to cover my bed. Last time I didn't even think to bring a quilt and I was the only one *blush* without a quilt on my bed. 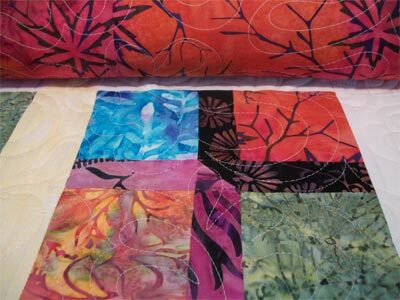 On this quilt I thought I'd try a free motion feather all over design. I'm very tickled with how it turned out. I will be using this on other quilts in the future...after I find a new home for the quilt frame! 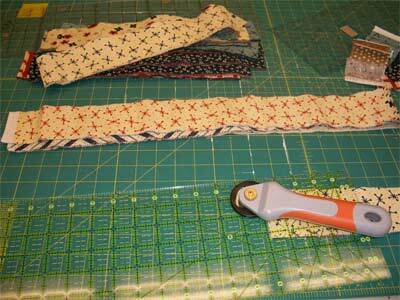 I have been quilting, quilting, quilting and now I'm getting another couple of tops ready so I can quilt some more :) I'll be binding later. 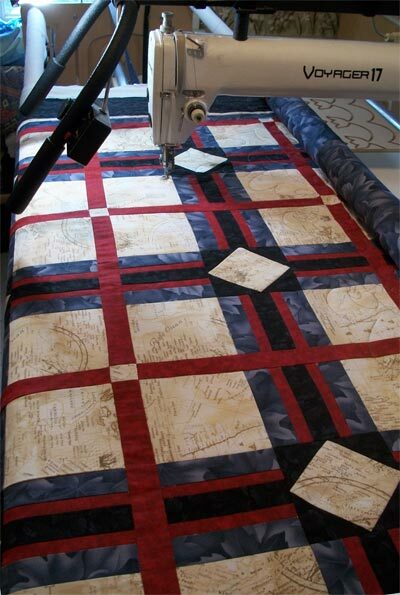 The Peanut has been sleeping in the den ever since we brought her home and I really would like to have her move into her room, so I have to quilt some tops as quickly as possible so we can tear down the Voyager to make room for her bed! boring, I know. BUT it gives the fabrics I received star billing, so I am plugging away, happy with the results so far. "Anything that can go wrong, will go wrong". My parents and my sister planned to come, too. They arrived on Thursday and then we caravan-ed up to Schroon Lake, NY together. Wednesday...the toilet stopped working. I reached into the tank (gross!) and found out the chain and the flap thingy were broken. Thankfully we had purchased a new toilet to match the new sink, so Army Guy replaced the toilet on Thursday, rather than replacing the chain/flap. I needed to do laundry on Thursday if I was going to be gone over the weekend. So, the washing machine decided to not drain. I got lots of error codes, but not clean clothes. My Army Guy and I worked with it off and on (while taking care of other tasks - see paragraph above and below) and I finally got my clothes clean. The children were in charge of vacuuming the floors on Thursday (so grandparents could have clean floors to walk on) and the vacuum decided to make nasty, loud, horrible noises. 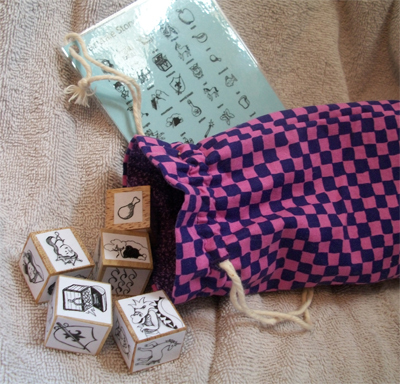 Time out to play with vacuum to see if I can make it work (yes, someone had vacuumed up a zip bag). Saturday we got on the road in decent time, but half hour up the road the van overheated. We limped off the road and found a place to pull in. My dad and Army Guy went off to find help. *sigh* it might be a cracked head. Nothing can be done on the van on a Saturday and we are not in a metropolitan area. No rental cars available nearby. Army Guy found one an hour and a half away (yeah, right!) and then went with my dad to see if there was on at the airport in the last city we passed through. 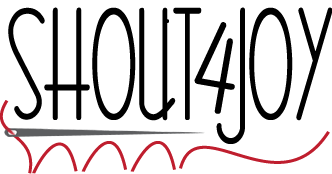 FOUR hours later (sitting in a little restaurant with a teenager, a preteen and a young one) we finally got back on the road with a four door sedan rented at the airport. 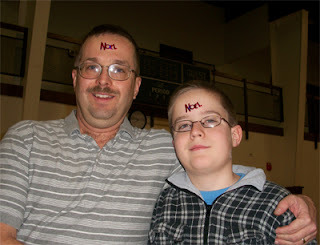 I am SO glad that my parents were along and the guys could take care of issues. We still have to deal with a minivan sitting many hours away. May it not cost more than we can afford to fix the thing up...our reserves seem to have been eaten up by car repairs over the last couple of months already! Sunday, it rained. Graduation had to be held indoors and we couldn't all get tickets, so some had to sit in an overflow location and watch a video feed. Monday we all crammed in the four door sedan to make the (long) trek back to our house and our GPS decided to play tricks on us. It took us off and right back on the interstate, so we didn't believe it the next time it tried to get us off the interstate and we went (way) out of our way. We came home and found that the other toilet was leaking (guess what the Army Guy did today?). This will be a weekend of family memories to remember...and may we not have a repeat any time soon! 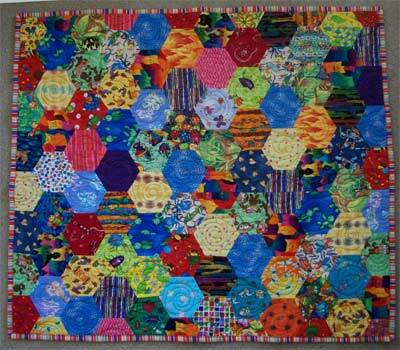 This is a quilt I made a few years back in response to an ArtImage Challenge. 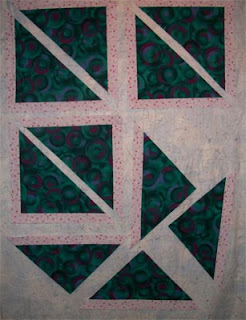 Several times during the year a piece of art was chosen and then we were to create a quilt inspired by the original art piece. American Gothic was our inspiration piece. I knew that American Gothic was a portrayal of a father and his daughter so that got me thinking about the relationship a father should have with his daughter. I chose to use a flower to portray this. A father should be the one to nurture his daughter, shielding her from what could harm her, giving her a firm foundation so her roots are strong, giving her stability so she can grow up and out and bloom into something beautiful. I thought Ricky Tims' Caveman Quilting techniques worked well to go with my vision for this quilt, making it more free form as a man does not have full control of how it will all turn out in the relationship, just like this method of piecing! 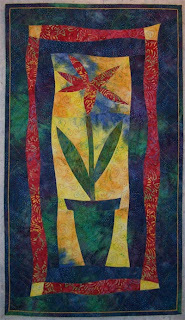 I free-motion quilted using a flowing crosshatch, swirls, hearts and straight(er) lines in the flower. 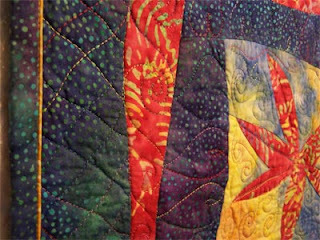 I have entered this quilt in an online contest at The Quilting Gallery. The contest starts Friday the 20th, so if you are so inclined, pop over and vote for my little quilt! 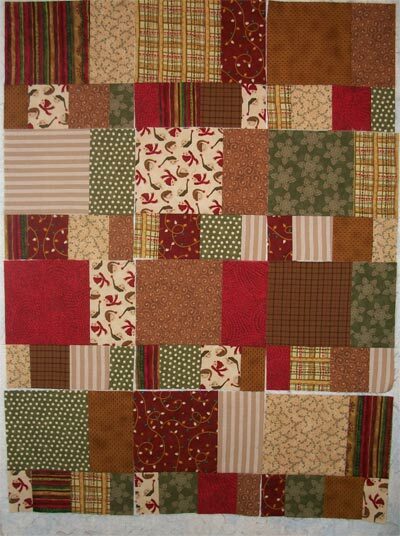 I just bought fabric to make borders for the White Bag Challenge that I've been working on, but I really need to get some quilting done as The Peanut comes home from college in two weeks and she is going to want her bedroom back (I have taken it over for my Voyager). In fact, we ate a little bit late...as I was SO close to being done! Tomorrow I think I'll hit the LQS to get border fabric(s) as I want it still a bit bigger than this. I think I'll get the green snowflake fabric, but I'm not sure until I audition the fabrics. Now I'm off to the theater. I get to read Molly McGee and assorted other parts during out Radio Theater performances (tonight and tomorrow). I have completed blocks C and D! As you can see, he has a pillow, a comforter (that he got free from a yard sale yesterday) and at least three books, a magazine (or two) and an Army Times (not all visible in this photo). Since I worked past lunchtime getting block A done...I had to cut my afternoon shorter so I can feed the children (you'd think they would feed themselves by now!). I have 12 of Block B done. In the morning, I should be able to get blocks C and D done...as long as I don't have to frog-stitch! 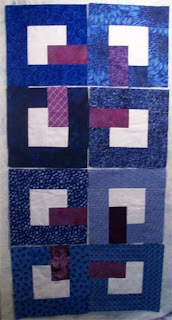 This afternoon, I hope to get all 12 of block B finished. Not loving the colors...I like most of the fabrics, but it is way too brown for me. 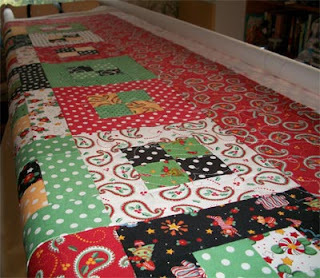 I'll plug away at it and finish it as it is easy...but...it won't be my favorite Christmas quilt (maybe I'll have to gift it to someone this Christmas, eh?). If you have been reading my blog, you know that the snowman head print was the inspiration fabric, my aunts, sister, mom and cousin all added FQs and now I have to make something before our get together in October. I chose the Crazy Eights Pattern by Bits and Pieces but want to make a bit larger pattern, so I added a few more FQs last night. If I get bored with working on this one (the colors are a bit dull), I will start cutting fabrics for a mystery that starts September 1st on the about.com quilting forum. One of the members is leading us in the DaChintzy Code Mystery that she wrote. My fabrics are a bit brighter for this one. 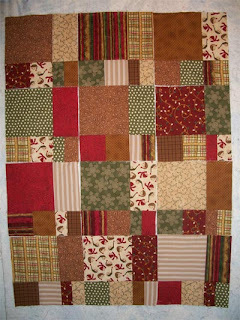 And I can always head upstairs and quilt on the Christmas throw I pieced from a Mary Engelbreit jelly roll (last year). My pitiful looking design wall has some blocks that Princess Sunshine is working on. I think I need to take all the extra threads off (how???) or just put up a new flannel backed tablecloth (cut in half, I have a tiny spot to hang it). Mean mom is "forcing" the children to make quilts. The Boybarian is almost ready to put his quilt on the quilt frame, but Princess Sunshine chose a much larger and more complicated design, so hers is taking much longer. She has four more of these blocks to make and then she gets to work on the stripes that will become the corners of these blocks...it will be gorgeous when she is done! I have been busy with the Voyager. I finished off two quilts and mailed three (one of them being the purple Spin Cycle quilt) the end of last week (payday being Friday) and loaded This Guy's Quilt that I started a couple weeks back. 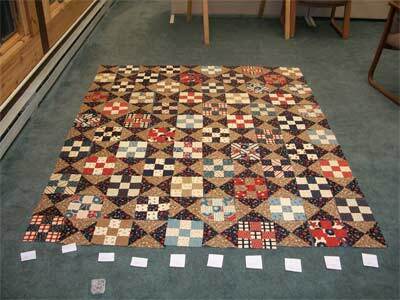 I've almost finished the quilting and then the binding (my least favorite part). I am doing a freemotion fleur de lis inspired design that I've been doodling...it is the second quilt I've used it on and I'm feeling more confident on this quilt than the last one. By the time I get to The Boybarian's quilt (that I only have a few blocks for, see last week's design wall) I'll be doing it in my sleep! 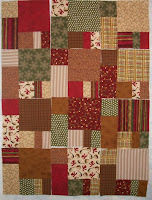 Check out Patchwork Times for more Monday Design Wall posts! For her birthday I was inspired by the tutorial on this blog and immediately went searching ebay for an elongated Penny...and found a Brontosaurus one (she used to REALLY be into dinosaurs) that was perfect. 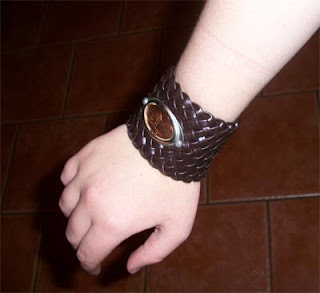 I found a fun belt at Goodwill and bought the other items needed...and crafted away (it was a quick and easy project). I chose to use a chunkier belt than the tutorial shows as I thought it would be a belt she would like. The woven belt just called her name when I walked past it in the store...those wimpy little belts didn't stand a chance once I spotted this one. BTW, she loves it (at least she says she does).